Zimbabwe’s prime minister Morgan Tsvangirai was visiting cholera patients at a hospital in Harare. HARARE, Zimbabwe (CNN) — Zimbabwe President Robert Mugabe was celebrating his 85th birthday with a lavish all-day party Saturday despite the fact that the country is gripped by an economic and health crisis. Mugabe invited Prime Minister Morgan Tsvangirai, his new partner in a power-sharing government, but a Tsvangirai spokesman said the opposition party leader turned it down. Tsvangirai said it is a political party function and as the prime minister, he is not obligated to attend, the spokesman said. 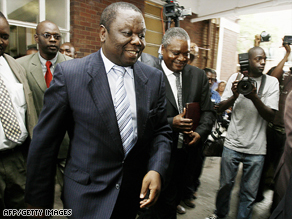 Friday, Tsvangirai visited Harare Hospital, one of the country’s biggest, and said its intensive care unit will need $30,000 in order to start operating again after a funding shortage. Mugabe’s ZANU-PF raised $250,000 in order to hold the party. Though he was holding his party Saturday, Mugabe’s birthday was seven days earlier. The party was being held at the university in Mugabe’s hometown of Chinhoyi, about 150 kilometers (93 miles) outside of the capital, Harare. Attendees will mostly be elite ZANU-PF members, but the president also invited schoolchildren from around the country. They will all be treated to food, music, and a likely speech by Mugabe. In previous years, Tsvangirai and others have criticized the birthday parties as a waste of money, a splurge when Mugabe’s countrymen are facing food shortages and a worsening health situation. Since Mugabe’s last birthday, a cholera epidemic has hit every corner of the country, killing 3,731 people and infecting nearly 80,000, according to the World Health Organization, which quoted Zimbabwe’s Ministry of Health. The preventable disease has spread through Zimbabwe’s 10 provinces through lack of access to clean water, faulty sewage systems, and uncollected refuse, according to Medecins Sans Frontieres (Doctors Without Borders), which released a report this month on the outbreak. Sunday, Tsvangirai appealed to the international community to help Zimbabwe’s crippled economy, saying that it would take $5 billion dollars to stabilize the country. The cholera outbreak has worsened Zimbabwe’s economic crisis. An acute food shortage because of years of poor agricultural production, widespread corruption and failed government policies have ravaged Zimbabwe’s currency, whose inflation rate is the world’s highest. Simon Calder: Should tourists now return to Zimbabwe? … presented in the Burma Media Conference to a female reporter who reported about an area of the country that was devastated by Nargis cyclone… last year. CHA-AM, Thailand—Southeast Asian officials on Friday praised a proposal for the creation of a regional human rights body as a historic first step toward confronting abuses, but the body will lack the power to investigate or punish violators like military-ruled Myanmar. A confidential document obtained by The Associated Press says the rights body, which the 10-nation Association of Southeast Asian Nations hopes to form later this year, would “promote and protect human rights and fundamental freedoms” in the region but will abide by the bloc’s bedrock policy of not interfering in members’ internal affairs. The document, which outlines the proposed powers of the future rights body, falls short of key demands voiced by international human rights groups, which say the body will have limited effectiveness unless it can impose sanctions or expel countries that violate the rights of their own citizens. ASEAN traditionally shies away from criticizing its members, although some leaders said that issues of democratic reform in Myanmar and human rights abuses were being discussed on the sidelines of the conference. The document was presented behind closed doors to ASEAN foreign ministers gathered at a coastal resort in Thailand ahead of an annual leaders summit this weekend. The draft is the first one to outline the body’s proposed powers; a final one is expected in July. “It is a historic first for Southeast Asia,” said Rosario Manalo, a Philippine diplomat on the panel that drafted the human rights body’s outline. Despite the attention given so far to the human rights issue, leaders say the summit will focus on the global economic meltdown and how the export-dependent region can best cope with the crisis. ASEAN signed a free trade agreement with Australia and New Zealand on Friday, a pact that could boost the combined gross domestic product of all 12 nations by more than $48 billion by 2020. Officials sought to temper criticism of the proposed human rights body, saying the powers of the body could evolve over time. According to the document, the body would follow the principles of “noninterference in the internal affairs of ASEAN member states” and any of the group’s decisions “shall be based on consultation and consensus,” giving Myanmar and other violators veto power to block decisions. International human rights groups have urged ASEAN leaders to press military-ruled Myanmar to end its rights abuses, including detaining thousands of political prisoners. 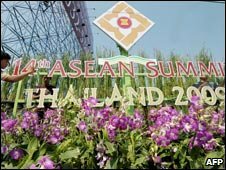 The summit, hosted by current chair Thailand, is the first since the group signed a landmark charter in December to make ASEAN a legal entity and move it a step closer to its goal of establishing a single market by 2015 and becoming a European Union-like community. ASEAN’s 10 members — Brunei, Cambodia, Indonesia, Laos, Malaysia, Myanmar, the Philippines, Singapore, Thailand and Vietnam — range from very poor to moderately rich. Associated Press Writers Jocelyn Gecker and Stephen Wright contributed to this report. Burma’s regime deliberately blocked international aid getting to victims of last year’s cyclone, a report has claimed. The first independent inquiry into the aftermath of the disaster has said the authorities should be referred to the International Criminal Court for stopping help getting through and persecuting survivors. 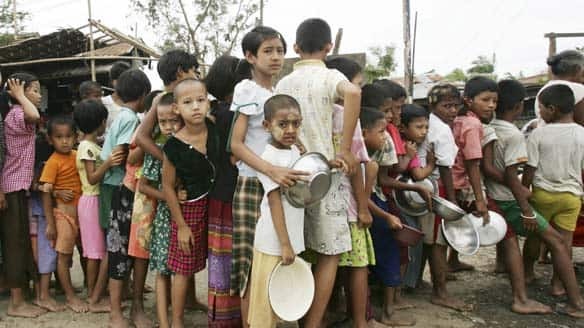 It found the Burmese leadership failed to provide adequate food, shelter and medical care in the wake of Cyclone Nargis which struck the Irrawaddy Delta on May 2 last year, killing at least 140 000 people. Around 3.4 million people were effected by the disaster, which swept away homes, farms, granaries, livestock and wells. Researchers from Johns Hopkins University in America and an organisation of Burmese volunteers called the Emergency Assistance Team – Burma (EAT) have documented what happened in the following weeks. Military checkpoints were set up across the delta as the regime treated the disaster not as a humanitarian emergency but as a security crisis. The report claims some people who attempted to distribute private aid were arrested. It details allegations of aid being stolen and resold by the military authorities. 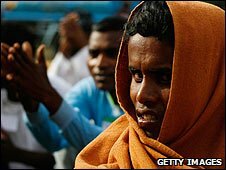 The researchers also claim the army used forced labour, including of children, in the aftermath of the disaster. According to one survivor: “[The army] did not help us, they threatened us. Everyone in the village was required to work for five days, morning and evening, without compensation. Children were required to work too. There were also anecdotal accounts of people dying in the aftermath of the cyclone due to the actions of the army. But restrictions in the country mean no one has been able to estimate how many died in a supposed “second wave” of deaths in the period after the cyclone. Under international law, creating conditions where the basic survival needs of civilians cannot be adequately met, “intentionally causing great suffering, or serious injury to body or to mental or physical health,” is considered a crime against humanity. The report concludes that the United Nations Security Council should refer the junta for investigation by the International Criminal Court. Once again, UN and US pleas for the release of all political prisoners in Burma will be met with deafening silence, as is always the case where the Burmese junta is concerned. It should be evident to the UN, the US and the EU that the junta is determined to carry on its charade of a 2010 election. Everyone knows that this fiasco is aimed at cementing the regime’s rule through some “democratic” trappings and is in no way going to lead to real democratisation and reconciliation. Just as a reminder, the constitution is drawn by the military and the election rules will be the same. In the end, the junta will be allotted 25 per cent of the seats without election and the rest will be for its self-created USDA-like parties or affiliates. It is all going to be stage-managed. A few individual parties will be allowed to contest, for the sake of window-dressing, and nothing radical will come out of it. The junta could create a turning point for the better, just in a single day, simply by releasing all political prisoners, calling for a nationwide ceasefire and implementing a process of reconciliation and all-inclusiveness in the political arena. However, this scenario is just wishful thinking. The world body and influential stakeholders can only make a difference by imposing a new, fair game plan, rather than going along with the junta’s self-serving roadmap. All of the refugees had to flee their homeland to escape abuses by the ruling military junta. Without papers the refugees are treated like criminals, ..
… have voiced concerns that the human rights body may not have power to stop abuses in countries where human rights remain concerns to the world like Burma. Will US Oil Companies Return to Burma? Asean’s members are Brunei, Cambodia, Indonesia, Laos, Malaysia, Burma, the Philippines, Singapore, Thailand and Vietnam. Letters: A tribute to Michael Cullen, Update on the UVSS, and more!